Recently retired Chief of Justice of the Australian Federal Court, the Hon Michael Black AC inspired our graduation audience as he was honored for his contribution to the law. Graduation is always a special occasion for the Law School. There is, as many of you will recall from your own graduation, the air of excitement in Wilson Hall, lots of photos with proud parents and a mixture of nostalgia and relief as student life is formally brought to a close. It also provides a significant opportunity for the University and the Law School to recognise outstanding contributions to legal education, practice and more broadly across the profession. 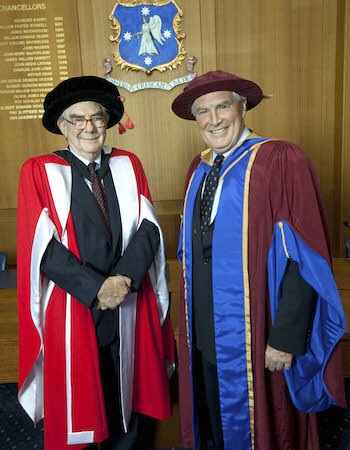 This year the University conferred its highest honour, the Doctor of Laws honoris causa on esteemed alumnus and recently retired Chief Justice of the Federal Court of Australia, the Hon Michael Black (LLB 1963). In accepting his award, the Hon Michael Black said, "To be honoured, as a lawyer, by the University from which one graduated in law, and for which one has great respect and also affection, is a very moving experience. I am deeply grateful." Addressing our 269 graduating students, he called on them to engage both their "intellect and imagination" and to use "creative thought of the highest order" in their practice of law – describing it as "an honourable calling". "The practice of the law, in whichever of the numerous ways you undertake it, can be – and in my view absolutely should be – a highly creative enterprise. The essence of creativity, in the sense in which I now use it as applied to the law, is the application of imagination to the intellect. It involves being inventive. Intellect is the necessary base, and knowledge must rest on top of that, but for a really good lawyer there is a further layer, and that is creativity." "Creative thinking by lawyers can change the world," he said. Reflecting on cases where important changes had been achieved through creative thinking, he highlighted the original Mabo case in the High Court and the cases that followed it in the Federal Court. In closing, the Hon Michael Black offered graduates these thoughts: "My experience in the law has convinced me that the really good lawyers are those whose depth of understanding of the law is illuminated by a richness of other interests, preferably both intellectual and practical. I now commend to you the further idea that on top of that should be the realisation that, your best work will be done when you assume, with passion, the role of a creative artist who works with words and thoughts." Melbourne Law School offers heartfelt congratulations to our 2009 graduates. While your time studying at the Law School may have come to an end, we hope that your relationship with us will continue. As a graduate of the Law School you automatically become a member of a strong community with members across Australia and throughout the world. From the moment you graduate you have access to all the benefits, services, events and activities that are available to all our alumni. These include our extensive program of public lectures, research-specific workshops and seminars, national and international alumni reunions, as well as access to the Law Library and the Alumni Lounge. Benefits specifically for recent graduates include a careers consultation for up to six months after the completion of your degree and a dedicated Alumni Careers Evening. The Careers Office can help you with job-seeking skills, applications, alternatives to legal practice and general career direction. Being a graduate of the University of Melbourne you are also entitled to the extensive range of benefits afforded to the broader alumni community. Among many other things, alumni are able to use the University sports facilities, attend special events at the Ian Potter Museum of Art, and visit the University's Cultural Collections. The strength of our alumni community lies in the engagement of its members, including its most recent ones, so we extend to you a warm welcome and invite you to take your place in our thriving network. Image: The Hon M.E.J. Black AC and Michael Crommelin AO, Dean , Zelman Cowen Professor of Law.